Pingi | Our new generation moisture absorbers require no refilling! Eliminate mould, moisture, and musty smells from a variety of places with the Pingi reusable moisture absorbers. These mini dehumidifiers can be placed virtually anywhere in the home, on a boat, in a caravan or car. Our product range is sold in 22 countries and has undergone extensive testing in Europe and the USA, meeting the highest international quality standards. Our eBay Reviews are a source of some pride. Please have a look to see what our customer think about our service and products. Our Specials page will give you outstanding value for money. Pingi moisture absorbers improve air quality and protect valuable possessions from the damaging effects of moisture. 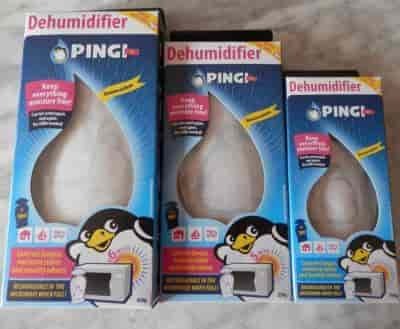 Pingi dehumidifiers are a revolutionary new way to dry small damp spaces using silica gel to absorb surplus moisture. Unlike other products, Pingi is reusable and does not require refills. Therefore, they represent a once-off investment – and a very modest one at that – leading to years of use! We provide quality products which are sure to impress, and provide superior online customer service and sales. The experts in our vocational training division helped us choose this outstanding range of rechargeable moisture absorbers. If you wish to hire large industrial dehumidifiers, click on the following links for Sydney or Brisbane. Don't delay, go to our Shop and buy a Pingi today! There are many situations where we encounter unwelcome moisture and musty odours. Areas listed below are often associated with these problems, and use of Pingi dehumidifiers will help alleviate such concerns and protect your valuable possessions from moisture and mould. Pingis are the superior and most sustainable method of removing moisture issues, as the products have been tested extensively and are made with quality materials to ensure reuse. Time to give moisture and mould the flick! Buy a Pingi today. Your family and health will thank you for it. Please note: The Pingi dehumidifier bags are a great moisture absorber and easy to recharge in the microwave. When the moisture indicator changes from blue to pink, full saturation has been reached. See our page on Recharging Pingis for further information.